MyCRM Blog | Microsoft Dynamics 365 – MyPDFCreator; helping you to keep your cool this summer! Whilst many are blissfully loving it, this summer really hasn’t been too easy in the workplace, especially for us older folk, who didn’t really expect to see a repeat of conditions last seen in 1976. For those of you that are too young to remember, or weren’t born, just ask your parents and they’ll give you the full 9-yard lowdown on it. The trouble with the heat is it gets me all hot and bothered, and whilst I like it from a “I hate rain” perspective, it really isn’t conducive to helping get anything done quickly. I find myself getting tired and anything at all repetitive really seems to annoy me (even more than usual!). Am I really spending most of my day traipsing back and forth from the chilled water fountain…seems like it! 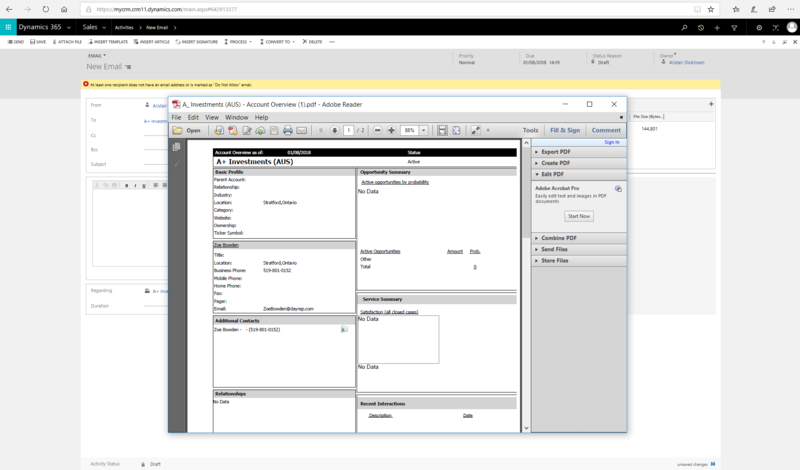 When it comes to Dynamics 365 at least I don’t have to suffer endless mouse clicks when producing a quote for customers, thanks to using our own MyPDFCreator productivity enhancement. For some of you out their you’ll know this as ePDF. Well the same tried and tested and globally well-loved enhancement has now been renamed, and along with a new name has been improved to be better than ever. The name now tells everyone what it does, indeed it creates PDFs, only really easily by saving on multitudes of mouse clicks in Dynamics 365 and anyone using versions of Dynamics CRM. I’m a big advocate of Dynamics in whatever variety, having been a user of it myself for over 13 years and feel well placed to reliably inform new and existing users just what makes it great…and sometimes perhaps where things can be improved. When it comes to mouse clicks, WOW, now this is a BIG issue and certainly one that can be improved by a GIANT magnitude. Microsoft is constantly improving the end user experience, with each and every new iteration bringing with it newly improved functionality and an ever easier user interface. Things really are becoming very streamlined, with D365 taking on a very engaging look and feel. HOWEVER, and it really is a BIG however, what about something as simple as being able to output a CRM report to a customer in a PDF format. Surely this must have improved and must be quick and easy…. well, um, er….NO, sorry but this remains the same. The same as it always was; just endless steps needing TOO MANY MOUSE CLICKS! Now let’s compare how much effort and time our MyPDFCreator productivity enhancement saves when trying to output a Quote from Dynamics 365 compared to doing it using out-of-the-box functionality. This quote is to be emailed to a customer in a PDF format. Option 1 - firstly, you can produce your quote and then hit the ‘Run Report’ function. This will eventually allow you to send the quote as a PDF after some TWENTY mouse clicks running through many steps! Just how hot and bothered would I be if I had to choose this option. Option 2 - uses the more modern function which is to use ‘Print Quote for Customer’. Whilst it sounds a little more promising, once again it is a rather multi-step process requiring many mouse clicks again. Through the use of Microsoft Office integration, you’ll be guided through a mail-merge process which again will eventually output the report for you to save as a PDF before attaching to an email. It is evident that whether you go down option 1 or options 2, without MyPDFCreator, you’ll be looking at a minimum of at least 15 mouse clicks for every report you want to create and send out. Now, we could just pretend that using out of the box options is OK. We can all just live with things the way it is and put up with multiple mouse clicks to achieve something that should really be so simple. Sorry, but I for one don’t accept this at all. 20 mouse clicks or 15 mouse clicks it makes no difference, producing a quote and being able to send it in PDF format remains totally tedious and an unnecessarily poor use of a user’s time, using out of the box functions. Just consider sending quotes or any reports to multiple recipients. Just imagine the effort to send 20 quotes out to customers, or x 50 Accounts reports as part of your strategic account planning routine. Multiply the mouse clicks and all that time…well let’s just say you’re going to need a mega-large ice cream sooner rather than later! Thankfully our MyPDFCreator enhancement really does help to alleviate all the effort, allowing users to generate the quote and get it to the customer very quickly and easily. With MyPDFCreator any quote (and any other Dynamics 365 report) can be produced as a PDF and emailed out in just 3 mouse clicks. That’s about the time it takes to say “MyPDFCreator”. Sending multiple reports is also easily achieved from the one single screen during MyPDFCreator production. So, just 3 clicks compared to 15 or 20 and one command for the many sends; now that’s what I call a major productivity gain! So the next time you find Dynamics 365 is making you a little more HOT and BOTHERED, forcing you to make those multiple mouse clicks, chill down and check out the MyCRM download centre and take a look and trial of MyPDFCreator. Things are going to cool down soon and this summer, like that of 76, will soon reside in the history files and no doubt we’ll all be talking about it for years to come. Whatever the weather brings in the future one thing is certain, with MyPDFCreator users of Microsoft Dynamics 365 will always be totally cool!